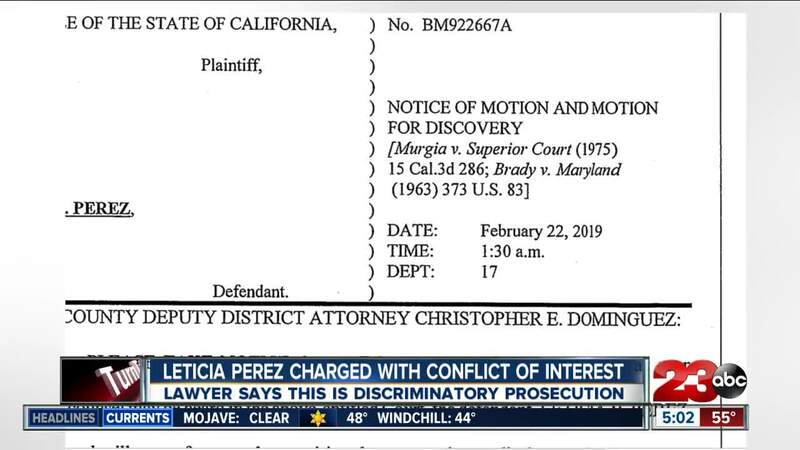 Attorney's for Leticia Perez are claiming that former District Attorney Lisa Green may have been racially motivated against Latinos when she filed charges against Perez in July 2018. Court documents obtained by 23ABC show attorney's for Perez have filed a subpoena against Green and are asking for the case to be dismissed. BAKERSFIELD, Calif. — There's new developments in the on-going conflict of interest case surrounding a sitting Kern County Supervisor. In a 181 page motion filed on Thursday, attorney's for Supervisor Leticia Perez are trying to get their hands on information from Green during her time in office. Attorney H.A. Sala is requesting all writings to and from Green that "Reflect any tendency in reason to reveal a racial and or ethnic prejudice against Latinos or Latinas." Sala alleges that other public officials charged with similar accusations as Perez have not been prosecuted by the District Attorney's Office. A defense he laid out during a 2018 press conference after charges were filed. In recent court documents Sala references the 2018 DA race, saying "Mrs Green strongly supported and endorsed Mr Scott Spielman in the race and Bakersfield City Councilmen Bob Smith also endorsed Mr. Spielman." Perez did not publicly endorse Spielman during the race, but did support his opponent, current District Attorney Cynthia Zimmer. Attorney's for Perez say there is evidence that her constitutional rights may have been violated and he was prosecuted for other reasons than for committing a crime. A gag order is still in effect for the case. Perez and Sala say they can't comment. 23ABC reached out to the DA's office on today's developments, but have not heard back. In the meantime, Attorney's for Perez are expected in court tomorrow where they'll ask for the case to be dismissed. A judge will hear the motion behind these latest accusations on February 22.